Do you want to keep your child away from mobile phones? Do you wish to engage them with something exciting other than just toys? 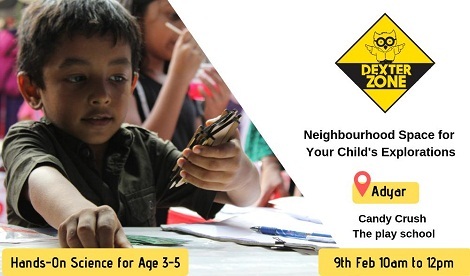 Dexter Zone is a Neighbourhood Space for your Child to Explore, Make & Experiment Hands-on Science Activities Every Week. 1) Your child will build their own project. 2) Individual kits will be provided. 3) Dexter Zone`s Facilitators will give individual attention to your child. 4) A surprise parent & child activity kit to take home. Give your Child a Glimpse of Dexter Zone.